Living the Dream: Serious Poker -- and Serious Fun! The Living the Dream team is heading to the Caribbean next week for TKPT St Maarten. 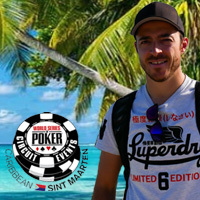 We'll have daily videos from St Maarten, following five online players -- Tim O'Keefe, Chris Perkins, Elena Stover, John Curcurcu and Gabor Kresco -- as they compete in the Main Event and as they enjoy all the fun-in-the-sun the tropical island has to offer. In this preview video, tournament organizer Thomas Kremser talks about what we can expect next week. The tournament attracts both professional and recreational players from around the world. It's serious poker -- but Kremser is also organizing island excursions like zip lining, ATV touring and a party bus with DJ and open bar, so there will also be some serious fun to be had! Watch this preview video to meet our five players and to get a taste of what's in store for them next week in the Caribbean. Check back here April 27th for the next episode -- or like our Facebook page to be notified when new episodes come online. The Living the Dream team for TKPT St Maarten: Chris Perkins, Tim O'Keefe, Elena Stover, John Curcuru and Gabor Kresco. If you're really worried, you can buy a pair of reflective sunglasses so no one can see your eyes. no deposit bonus codes here are more information about using bitcoin in casinos. They can be individualized by decal or hot stamp, and believe and look especially like the Vegas chips. 𝐒𝐮𝐬𝐚𝐡 𝐜𝐚𝐫𝐢 𝐒𝐢𝐭𝐮𝐬 𝐣𝐮𝐝𝐢 𝐨𝐧𝐥𝐢𝐧𝐞 𝐲𝐚𝐧𝐠 𝐛𝐢𝐬𝐚 𝐝𝐢 𝐩𝐞𝐫𝐜𝐚𝐲𝐚,,,?